We’re hunkered down again today. It was a blizzard this morning when we woke up. Bob and I really wanted to know the wind chill but our weather station anemometer stopped spinning due it to being caked with snow and ice from the cold winds. I’m not complaining one bit about the snow drift that was pushed against our front door when I went outside to get wood for the stove this morning; snow is needed for water this summer. I’m sure later while I’m out there pushing around the snow blower up and down our long gravel driveway that I might complain and utter a couple of choice words, especially if I break another shear pin from the big sticks and branches Peat manages to find from who knows where and leave scattered randomly on the driveway now buried in snow. Today is the day for doing those indoor projects you love and hate. After having papers and receipts spread all over our kitchen bar, Bob just finished doing our taxes and is now dreaming of a summer of fly-fishing in Montana and he’s doing research on Montana rivers and what kind of flies to tie. He also has a lot of school work to do today like grading papers, figuring out assignments, then practicing the bagpipes. He loves it. I’m waiting for the winds to stop. It’s pointless blowing snow when it will blow right back in my face. Bob’s recovery from his spine surgery is going well but he’s still not able to lift or move heavy things (or so he claims). Shoveling snow and snow blowing is my project today. In the meantime, I’ve been going through hunting photos from this season and finding the ones that represent just a small taste of our season spent with good people and better dogs. Your photos are always so inspiring, Leslie! Katie, I’ve seen some of your photos, you need to share more of them. Thank you Buck and thanks for reading our blog. Looks like it was a fine season. Come up to Hamilton and fish the Bitterroot! We’ve waded the Bitterroot a couple of times. 3 years ago, up the West Fork Road and this summer we stopped for a quick fish on the Bitterroot above Hamilton on our way to Lolo Pass. It looks like a drift boat might be the way to go? Thank for the comment and reading our blog. Another super post. An odd shear pin is a small price to pay to live where we do……says one that has to indure another 80 degree day in South Texas. Sam. Enduring 80 degrees in Texas? I’m sure if I should be envious or happy to be living where it’s cold. That shear pin is a small price to pay, we knew what we were getting into when we moved here. Bob did order some more just in case. Dumping snow again now and it’s supposed to snow all week. If it keeps up, there will be some left for you to shovel off your driveway when you come back to Idaho this spring. I’m not a big fan of the blower after spraying gravel from our gravel driveway everywhere. We made the dogs stay inside and clear of my path in all directions. I ended giving up and shoveling it and letting the dogs outside to join me. Shoveling snow is better. I try and help out with the I guess you could call it “Man stuff” but I’m not about to learn how to change the oil in our vehicles or learn plumbing or electrical stuff to crawl around the attic or under the house. I’ll leave that to Bob. I’m very lucky too. Cheers. I have a contact for fly fishing wisdom in the Paradise Valley and every where else in Montana. http://www.brantoswaldflyfishing.com/. Brant Oswald grew up with me in Twin Falls. We started fly fishing together in high school. We served on the debate team, discussed great topics like what size bow did we needed for mule deer, war and peace, civil rights and the females we dated. We argued whether or not the Renegade dry fly was an imitation of fish pellets that the commercial trout farms spewed out by the tons along the Snake. We discovered Silver Creek and were awed by the hatches, the smooth chalk stream waters and the quiet, selective sips of rainbows and browns. After decades of traveling separate paths, we reconnected ten years ago. Brant guided me on the Yellowstone. We hunted Huns and told stories, some of them true. Brant is a wonderful conversationalist. His love of Tolkien led him to degrees in linguistics at Eugene then he left academia for his deepest love: fly fishing. His deepest flaw is he hunts with Labs not Brittanys. We hunted chukar occasionally back in the 70’s. More commonly pheasant, Huns, quail and the periodic grouse. Please make contact. He’ll discuss flies, technique and Montana waters. He’s a great teacher. You’ll have much in common. Hi Mark, thanks for the nice comment, and for the contact with Brant. We’ll get in touch with him as we get closer to heading up there. Looks and sounds like a great guy, and Paradise Valley is one of my favorite places. I look forward to meeting him, assuming we can catch him between fishing season obligations! Great post! Makes me wish I wasn’t working and that the season wasn’t ending tomorrow. It’s the last bird we can hunt until fall unless you count spring turkey here in Utah. Thanks for the comment. I miss hiking in the hills with my dogs the most. 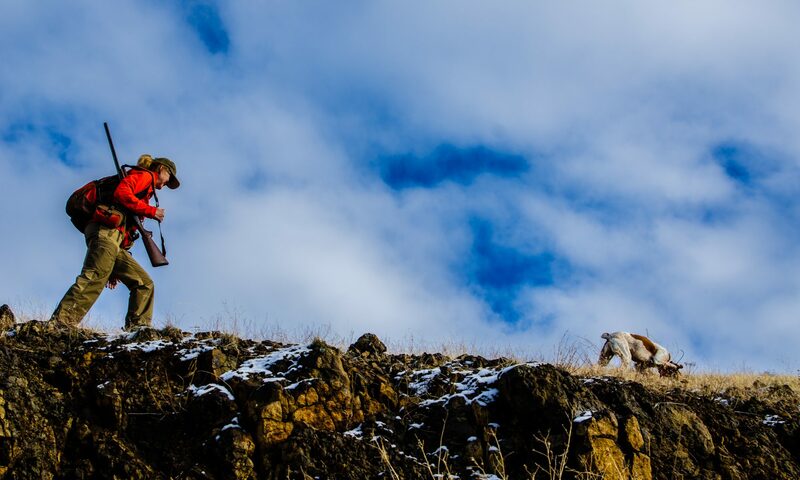 If we weren’t having so much snow I’d be out there looking for deer sheds and getting some good exercise…dogs included. I read your post about earplugs. Bob has some hearing lost, I always wondered if was hunting related? Thanks for writing about it. Autumn will be here before you know it! Just delightful, and testament to an autumn and winter well spent. I’ve spent my lifetime fishing Montana & Idaho (and became a fish researcher as a consequence), so would be happy to pass along tips on a couple spots…as long as you keep them secret! I don’t think I’ve had the pleasure, but we’re of similar vintage and I’ve cited his work in some of my own (https://scholar.google.com/citations?user=o7sXgpEAAAAJ&hl=en). Give a shout should you pass through Missoula. and I’ll point you toward some places to wet a line. It was a great fall. We miss it.